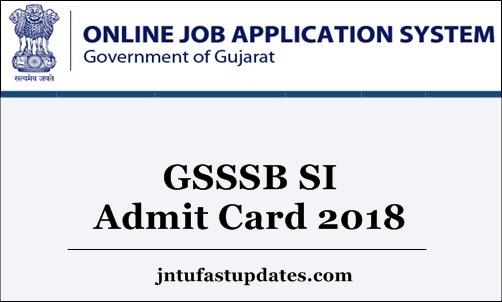 Gujarat Police SI Hall Ticket 2018 Download: Gujarat Subordinate Service Selection Board (GSSSB) Sub-inspector admit card will be made accessible on the official website, ojas.gujarat.gov.in. Aspirants applied for Gujarat SI posts can download and preserve the hall tickets without fail to carry to the examination. Without showing the admit card at the examination center, candidates will not be permitted to attend the test. Hence it is most important to take the call letter while going to the test. The authority will notify about the hall ticket availability date shortly. Keep checking the updates from OJAS Gujarat website on a frequent basis. This year the competition is expected to be harder for the Sub Inspector of Police jobs in Gujarat. Hence the applicants can get ready to crack the competition by preparing well for the examination. Gujarat Subordinate Service Selection Board (GSSSB) is the state government authority that recruits the suitable candidates into various government jobs every year. The organization releases various notifications based on the requirement. Recently, the GSSSB has released a recruitment notification for 433 Sub Inspector posts. GSSSB accepted applications for SI posts from 22nd November to 15th December 2018. The organization received a large number of applications from the eligible and interested aspirants. Selection of aspirants will be done through written test (preliminary, mains exams), physical standards test, and physical eligibility test and interview rounds. The competitors have to qualify all these rounds with good merit to get selected for Gujarat SI posts 2018-19. Hopefuls competing for the GSSSB Police SI posts 2018 can check more details of SI written test schedule, hall ticket availability date and other details from the following. Name of the Board Gujarat Subordinate Service Selection Board.